1. 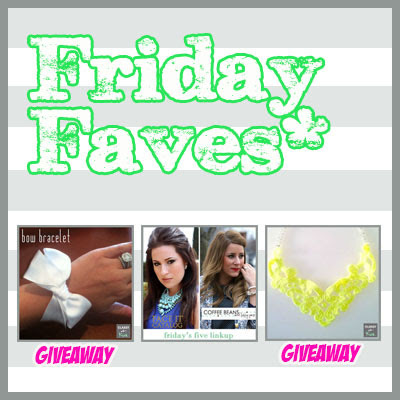 The beautiful Amy from Fashion and Beauty Finds is not only wearing a CWAK lace necklace today but doing a giveaway so you can win one yourself. 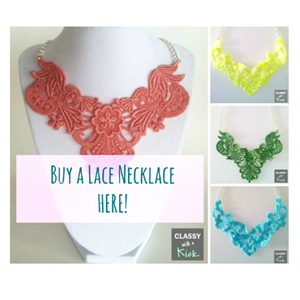 Even if you have every single color of lace necklace already, please hop on over to Amy's blog and check it out. She is amazingly stylish and always looks effortlessly chic in her outfit posts. 2. I was selected as a Friday Five Linkup Finalist by Amber of Face IT Catalog and Amy from Coffee Beans and Bobby Pins (yay!). 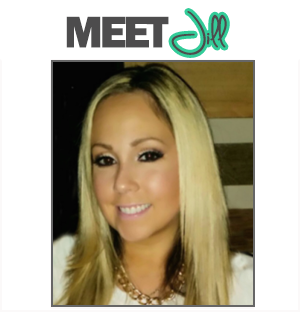 Each week these gorgeous ladies pick five blog posts from the previous week and post them on Friday for all to read. And this Friday, I was selected! Woo-hoo! 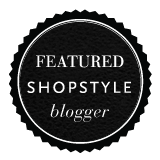 Be sure the check out their blogs to see the other finalists for the week! 3. I was dinking (is that a word? spellcheck says "no") around with some ribbon the other day trying to figure out what to do with it. At the same time, I had just ordered this Cara Bow Bracelet from Nordies and was literally counting the days till it shipped. I decided I couldn't wait for it anymore, took my ribbon and made myself a homemade version of the bow bracelet! And then I wore it out and got so many compliments on it (and one offer to buy it), I decided that I am going to start selling them in my Etsy store! It's really black...even though it looks navy! give one away to one lucky reader!!. All you have to do is comment below and let me know what color bow (black or white) and what color chain (silver or gold) and I will pick one winner. And hey, if you hate bows, you can still enter because you can take it off and have a cute chunky chain bracelet - everyone needs one of those! 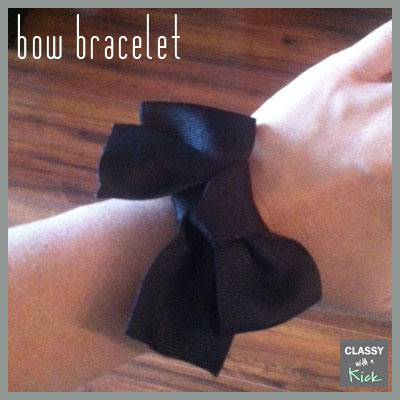 * Comment below to enter to win a bow bracelet before they are released to the public! 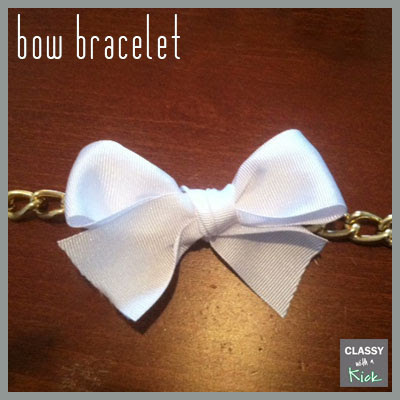 Oh the bow bracelets are so cute! 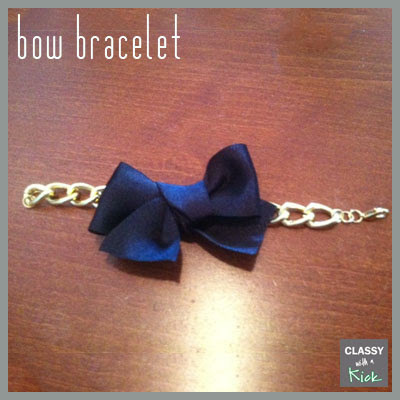 I'd pick the black bow with gold chain. :) Have a great weekend! Woo hoo girl! Congrats on the feature. Your bow bracelets are too cute. the bracelet you made is so cute! i'd pick the black bow on a gold chain. love them! 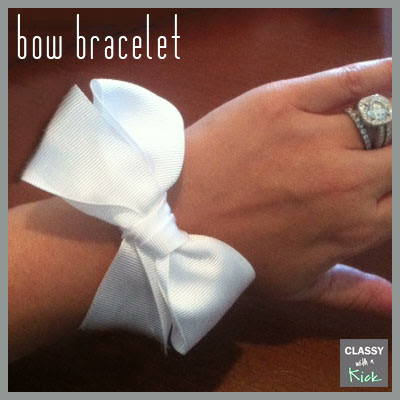 Love the bow bracelet!!!! The black with the gold chain is my favorite! 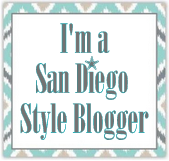 Love your blog :) and great giveaway! 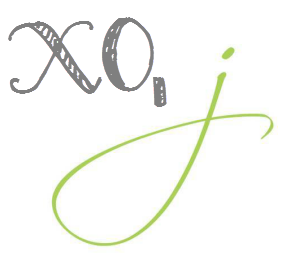 Following you now!